The Javelin® DNA series is our NEW generation of feature rich desktop ID card printers. This compact and powerful model is user-friendly and delivers outstanding performance at a great price. The Javelin® DNA series offers an all in one solution with high quality colour or monochrome printing. Our new upgrade options include dual sided printing, Wi-Fi, security locks, additional hopper and encoding modules. 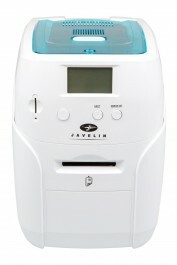 The Javelin DNA is an entry level manual feed printer and have LCD display for ease of use. The Javelin DNA comes with a 30 months printer warranty !